The shared office phenomenon shows no sign of slowing, prompting consolidation and M&A. With co-working increasingly seen as a mainstream option for businesses seeking office accommodation, activity in the sector is hotting up. Existing shared office providers are expanding rapidly with new sites while new entrants are targeting the space too; M&A activity is also on the increase. Shared offices, in which businesses pay for accommodation they need month-by-month and work alongside many other businesses, now account for a significant chunk of the market. In London alone, almost 850,000 square feet of co-working space was taken up last year – that was around 9 percent of all office space let in the capital during 2016. There is space for further growth. Co-working undoubtedly appeals to younger businesses and with start-ups continuing to launch at record pace – there will be more than 600,000 companies lunched in the UK this year, Companies House data suggests – demand is set to increase. Moreover, larger firms are increasingly attracted to the flexibility of this model too; it allows them to scale operations up or down very quickly, which is especially valuable during these volatile economic times. Outside of London, meanwhile, co-working is only just getting off the ground, accounting for 1 percent of lettings in the nine biggest cities beyond the capital last year. There too it can grow. These dynamics are driving consolidation and M&A activity in the co-working sector. 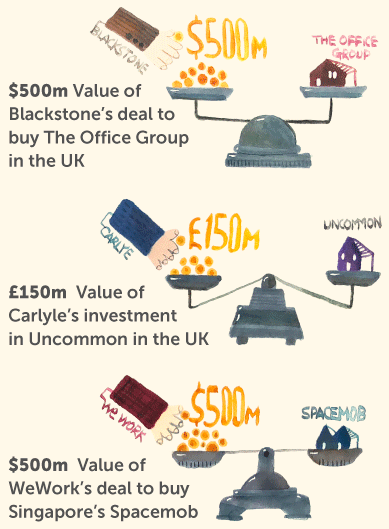 Earlier this year, the US private equity business Blackstone paid around £500m for The Office Group, which has a portfolio of 30 buildings in central London, Bristol and Leeds; its rival Carlyle has made a £150m investment in Uncommon, a new London co-working brand. Boost&Co itself has invested £3.5m of growth capital in The Clubhouse to help fund its expansion with new openings. The sector is also attracting interest from conventional property businesses. British Land, the real estate investment trust, has launched its own shared-office venture, Storey. Regus, which made its name in the serviced office market during the tech boom of the late 1990s, is also moving into this market. Savills, the property agent, has launched Workthere, a brokerage focused on helping businesses find co-working space. In such a buoyant sector, co-working company valuations are high, particularly relative to valuations in adjacent sectors such as serviced offices. 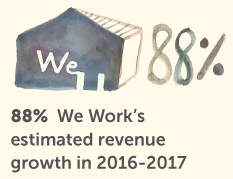 WeWork, the US shared office business with 120,000 members in 156 offices worldwide, is now valued in excess of $20bn according to reports of its latest fundraising. That has prompted some scepticism, but WeWork’s valuation is not without parallels – the latest funding of Singaporean co-working provider JustCo, for example, valued the business at $200m, though it has only a tenth of the membership of WeWork. The upside case for co-working valuations is that in addition to strategic drivers such as growing demand from changing patterns of work, businesses in the sector are able to broaden their revenue base with a range of additional services for members – everything from meeting room hire to gym memberships; some in the sector are also exploring partnerships with other enterprise service providers in sectors such as insurance. Less positively, the flexibility that represents such an important part of the value proposition in the sector also exposes providers to risk – with businesses not locked in as tenants, co-working spaces are vulnerable to client losses; a significant downturn in the tech sector, for example, would be a serious problem. Nevertheless, co-working is an increasingly international phenomenon, showing strong growth in Asia, where M&A activity in the sector is now significant, and Latin America, as well as Europe and the US. Further expansion, consolidation and deal making is likely.